The Ocean Rodeo Go-Joe is everything you need for leashless board retrieval assistance: Even stronger, better, lighter, and easier to use than before. A great idea and an innovative product that is moving from beginners to wave riders and mainstream users. If you don't have one it is worth to check it out. Traditional surfboard style leashes used to connect kiters with their boards have proven to be dangerous in both the water and on land. The GO-Joe is a new “leash free” tool to assist in the retrieval of your kiteboard without fear of being impacted or impeded by a leashed board. 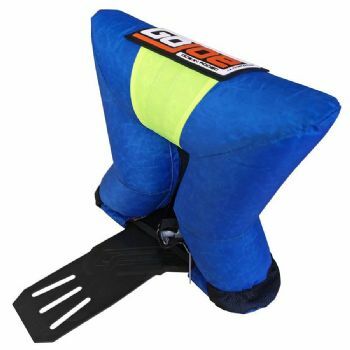 The GO-Joe is perfect for beginners and intermediates learning board recovery techniques. Advanced riders will appreciate the faster board recovery in extreme conditions or while learning new tricks. The GO-Joe is an inflatable tube structure attached to deck of the kiteboard that uses the natural forces of buoyancy distribution and wind to roll your kite board right side up and accelerate it down wind. 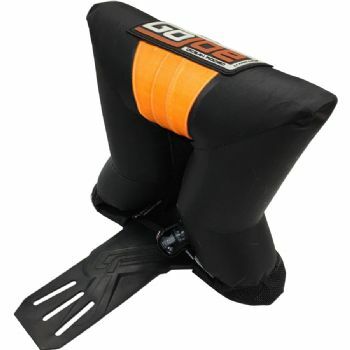 These features combined with high visibility and additional floatation will make the use of surfboard style leashes in kiteboarding obsolete. The unique hour glass design of the inflatable tube structure places the self righting buoyancy at a high pivot point. This distribution of flotation will power roll your board right side up if it lands foot straps down in the water (foot straps down create drag, slowing the boards drift). With the board right side up and foot strap resistance eliminated, the GO-Joe is positioned on the board forward of center allowing the wind to turn and sail the GO-Joe down wind towards the rider. If the rider maintains their position with the kite at the zenith the board will simply sail downwind towards you. The hour glass shaped design of the GO-Joe fits comfortably between the riders feet and does not restrict mobility. The hour glass shape also eliminates drag caused by spray from the boards rails. The GO-Joe is very light and durable using our proven manufacturing techniques. The inflatable tubes are manufactured with the same techniques and materials used on our kite tubes. 110 micron PU inner bladder with HD Nylon outer cover. Bomber! Deck mounting plate uses the same construction as our foot pad deck plates. Simply screw the GO-Joe into the grab handle inserts found on any board. Pump-up the GO-Joe tube, and you are ready to ride! Deflate the GO Joe for easy storage and transport. One size fits all; available in high visibility orange and yellow. Great gadget. 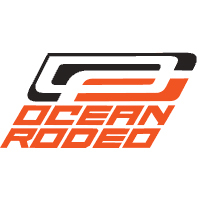 Please always include directions to the Ocean Rodeo installation video on YouTube, 'cause the printed instructions are illegible.